In February, Anne visited our direct trade partners in Costa Rica during harvest. 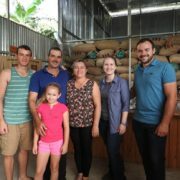 This year’s visit was special for Anne as she spent time at Finca las Torres in the Chirripó region of southern Costa Rica and participated in the harvesting and processing of the same coffee that will be in our Tasting Room this fall. Finca las Torres is located about four hours south of San Jose off the Inter-American Highway. ICAFE, Costa Rica’s Coffee Institute, has designated this coffee production region as Brunca. This area is more accurately defined however as the Chirripó micro region. 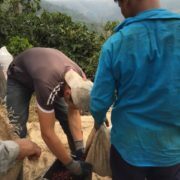 Here the coffee is grown at high elevation (around 1500-2000 meters) and has a distinctly different flavor in the cup when compared to the low elevation production in the Brunca region. Anne worked at the micro-mill during the morning with Régulo and Luis. The coffee which was drying was carefully raked on the raised African beds. Coffee which had been drying on the patio was then collected into Grain-Pro bags to continue the drying process. The activities in the afternoon centered on the farm. Coffee that is picked during the morning is collected by mid-afternoon. The coffee is measured and each picker’s yield is recorded. By late afternoon the coffee cherries are brought to the micro mill. During the evening the coffee cherry is de-pulped and laid onto raised African style beds. Café Rivense del Chirripó micro mill specializes in honey processed coffees. The coffee skin is removed during the de-pulping process but the fruit remains on the bean. The idea is to have the honey dehydrate on the bean—the honey must hold onto the coffee bean—which will mean the cup of coffee will have more sweetness. The balance of the trip was spent at farms in Tarrazu, Central and West Valley. Anne cupped coffees at the farms and arranged for Red Cedar Coffee Co. to bring fantastic coffees to your table. March 23, 2017 /by Anne D.